There’s nothing more that I love to use cooking than my crockpot. I love being able to put hearty, healthy ingredients into it and let the aroma fill the house for the day. During our first snowstorm last week, I made a roast turkey for us and our snowed in neighbors. The turkey was 18 lbs. and definitely much too big of a turkey for us, but I was thrilled to have leftover turkey to use in my favorite Crockpot Turkey Chili. 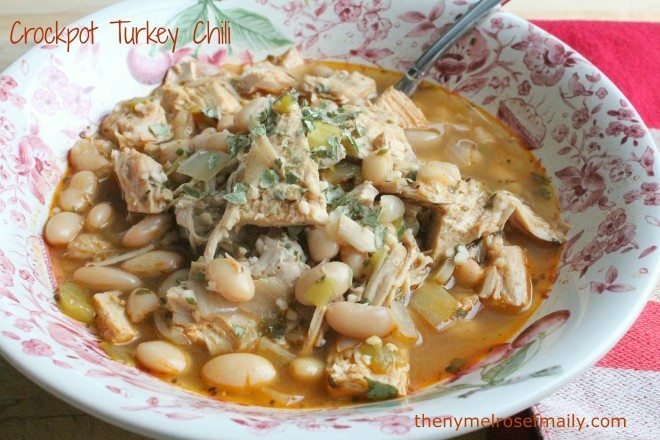 A healthy, family pleasing turkey chili recipe made in a crockpot. Riley went sleigh riding for the first time while dinner cooked in the crockpot. 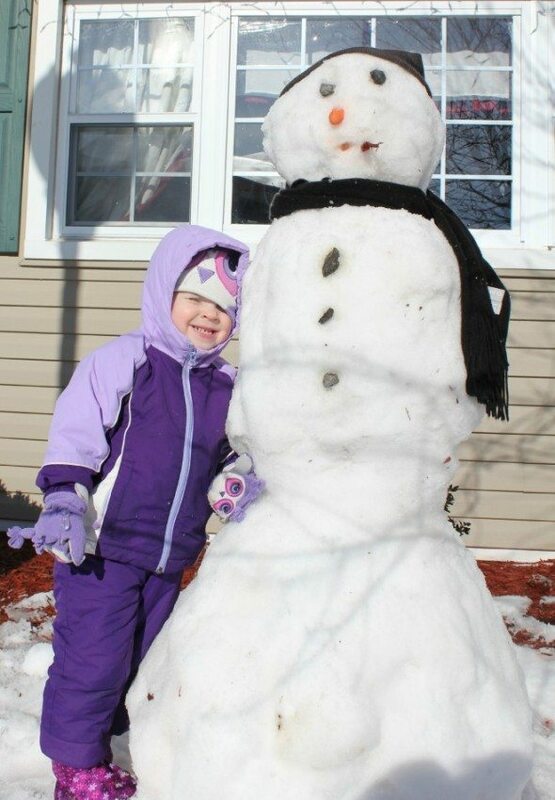 She also built her first snowman with Daddy. I love the ease of the crockpot and the ability to carry on with our life, while dinner is doing it’s thing in the crockpot. So proud of herself! A healthy, kid friendly turkey chili recipe that is made in the crockpot. Saute the onion & garlic in the olive oil until the onions are translucent & fragrant. Add the sauted onions & garlic to the crockpot with the rest of the ingredients. Cook on low for a minimum of 4 hours. Continue to add chicken stock if you are looking for a chili with more liquid. This looks so yummy! I’ve been in need of some new recipes for leftover turkey, this fits the bill perfectly. Thanks so much for sharing! And what a cute snowman and little girl! Have a wonderful day! Hi Jenny, I’m Anne from Life on the Funny Farm (http://annesfunnyfarm.blogspot.com), and I’m visiting from the Pinteresting Party. This turkey chili looks so yummy! Perfect for a cold winter day. Love your snowman picture, too.